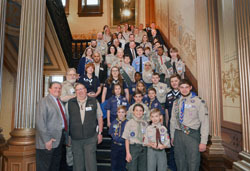 TRAVERSE CITY, Mich. — Sen. Wayne Schmidt welcomed Boy Scouts of America Michigan and their leadership to Lansing on Tuesday. Scouts from around the state, including northern Michigan and the Upper Peninsula, made the trip to Lansing to deliver their Report to the State for 2017. 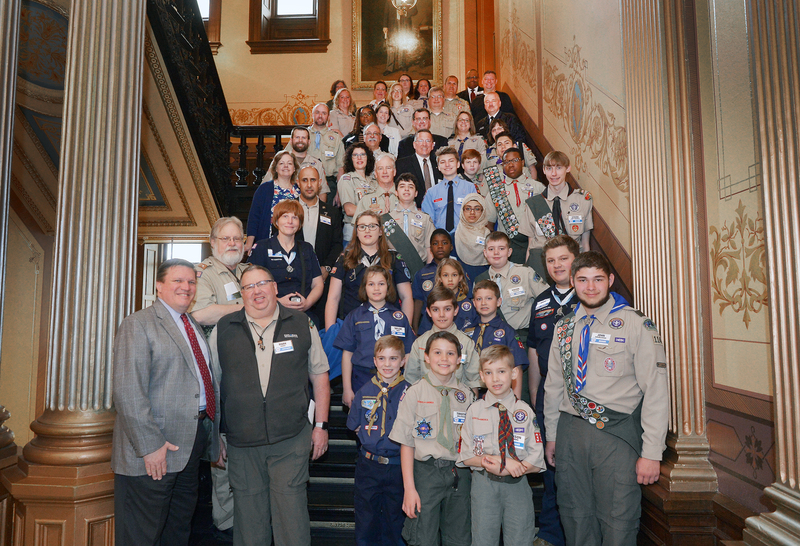 The report serves as an update both to legislators and the governor on the state of scouting in Michigan, scouting activities, service hours performed, community involvement and the number of scouts attaining the rank of Eagle Scout — which was 1,100 in 2017. Editor’s note: A print-quality version of the above photograph is available by clicking on the image or by visiting SenatorWayneSchmidt.com/photowire. Audio and video of Schmidt welcoming Tuesday’s guests are also available on the senator’s website under their respective tabs. Photo caption: State Sen. Wayne Schmidt, R-Traverse City, welcomes representatives from the Boy Scouts of America to the state Capitol in Lansing on Tuesday.